A friend of mine recently told me about a conversation she had with a business leader about Impact City, my vision for transforming Dallas into the center of the world for solving the world’s greatest problems. My heart sank. That is the last thing I want to do to our great city! I want to transform Dallas into the impact capital of the world. There’s nothing nonprofit about impact. The only thing that makes an organization a for-profit is that it is designed to make money for its owners. Pepsi, Soap Hope, Google, Radio Shack, and Whole Foods are all for-profit. They may have a mission, or not. They may be making money right now, or not. In the end, if there is money made, it will go to its owners (shareholders). The government collects taxes on the profits. For-profits are not inherently good or bad, sustainable or not sustainable, purposeful or not purposeful. They just have owners. The only thing that makes an organization a nonprofit is that it has no owners. The American Heart Association, the NFL, and the Republican National Committee are all nonprofits. They may have an important social mission (ending hunger), or not (the clown museum). They may serve the poor, or they may serve wealthy business members. Their leaders may be volunteers, or they may earn $40 million a year. Nonprofits are not inherently good or bad, sustainable or not sustainable, purposeful or not purposeful. They just don’t have owners. One key problem for nonprofits is that, since they don’t have owners, they generally struggle to scale. When Pepsi wants to build a new distribution facility in Africa, they can quickly and easily raise capital from investors (owners) because the investors will earn double digit returns. When Feed My Starving Children wants to build a new distribution facility in Africa, there is no source of capital other than donations, which may take years to raise, or may be impossible to raise. An organization is sustainable if its normal operations generate enough money to cover its expenses. Sustainability is not related to for-profit or nonprofit status. For example, the PGA (a nonprofit) is highly sustainable, as is Google (a for-profit). It’s important to note that for-profit does not automatically mean sustainable. Most startup companies are not sustainable. Blockbuster was not sustainable. Even Amazon is currently not sustainable. If a for-profit is not sustainable and doesn’t reform itself, it goes out of business when investors stop investing new capital. If a nonprofit is not sustainable, it goes out of business when donors stop giving it new donations. It’s also important to understand that while many nonprofit organizations are currently not sustainable, there are more and more that are partially or fully sustainable. When Esperanza International first started, for every dollar it took in, it used up the entire dollar. Now for every dollar it takes in, it can return over 70 cents after one year. In a few years, it will be fully sustainable. (3) Important purpose vs. non-important purpose. This one is easier to understand but harder to quantify. Pepsi’s core reason for being does not serve an important human purpose: it is made to sell chips and soda. Feed My Starving Children’s core reason for being does serve an important purpose: it is made to feed starving children. There is a large spectrum in between. People will argue over the relative merits of the ballet, spaying cats, beautifying parks, and the Clown Museum. The way I think about it, an organization’s purpose rises to the very top when its primary reason for being is to solve a key challenge of humanity. At Good Returns, we focus on these eight: poverty, slavery, water, conflict, health, energy, environment, and education. The United Nations’ Sustainable Development Goals offer a different take on top-purpose initiatives. With these three dimensions in mind, we can now identify what an Impact Organization is – and we can see how Impact City will approach solving the world’s greatest challenges. When an organization is scalable, sustainable, and very high on the purpose scale, we call it an Impact Organization (or IO for short). An IO can provide solutions to the world’s biggest problems (purpose), without relying on donations (sustainable), and access capital to expand everywhere the problem exists (scalable). Traditionally, sustainable for-profit companies focusing on top human problems have been rare, but they are growing in number every day. And traditionally, sustainable nonprofits have been challenged to access scaling capital, but Impact City will be promoting innovative business models such as the Good Returns model that enable such nonprofits to scale, turning them into Impact Organizations as well. For-profit and nonprofit Impact Organizations are on the way in greater numbers than most people imagine. Stay tuned to learn more about Impact City – I will be updating you soon on how and why we are creating the “Silicon Valley of Impact” right here in Dallas, Texas. It’s rare for a social entrepreneur to get through the gauntlet of hurdles to reach that amazing milestone she strives for: a functioning, growing, sustainable business that is solving a core problem of humanity. But even once she gets there, she faces a decision that can be excruciating: I call it the social entrepreneur’s Scaling Dilemma. Scaling strategy is yet another area where impact organizations face an either/or decision that profit-only businesses don’t have to make. A traditional business has only one thing to maximize: profits. Well-run businesses optimize their prices based on what will produce the greatest profit, not what will produce the greatest number of customers. If a company believes that raising prices will increase profits after taking into account lost customers, then that’s what it will do. But for a social entrepreneur, raising prices can be heartbreaking when the customer is disadvantaged. Not only are fewer clients served by the mission; those that are no longer able to afford the service will be the most disadvantaged in the pool. A clean water service that charges just enough to break even will serve the largest possible pool of people that it can reach. It also leaves the most money in those people’s hands as possible. If the facility increases its prices, it will be more profitable – but less people will be served, those that are served will have less money for other survival needs, and those that can’t afford the water at all anymore will be the poorest of the population. A water business run as a for-profit company with ROI as its primary objective will find the perfect price to maximize its profits, with no care at all to these social negatives. But for an impact organization, the loss of impact is a terrible side effect of increasing profits. Now here is the dilemma: those profits that the social entrepreneur is foregoing to serve today’s poor are the same profits that would enable the business to scale. Without profits, there is no self-funding capital to build the next water treatment plant. Without returns, there is nothing to entice investment capital either. So the impact organization, by maximizing today’s impact, has limited tomorrow’s impact. What should the CEO of the impact organization do? Should she maximize profits today, grow through reinvestment, and then accept lower profits later to increase scale? When should that happen? What if she knows that some people will die in the meantime? Should she pass up investors today, because she knows she won’t be able to downshift later to increase reach by lowering prices? This is a difficult moral place to be for the social entrepreneur. Good Returns works because it creates new value by providing businesses and their investors with a reason to invest capital into impact organizations. This capital provides a missing piece that solves the Scaling Dilemma. Profits are the end for traditional business. For impact organizations, profits are not the end – the mission is. But profits are a critical tool that provides the sustainability and scale that the impact organization needs to achieve its mission. This need to focus on both mission and profits creates a multitude of challenges for social entrepreneurs. We need to be working together to find structures and devices that transcend these dilemmas. If you have struggled with the Scaling Dilemma, please share your thinking process and the decisions you have made. If you have found other solutions to the problem, please share your approach so other social entrepreneurs can learn. Comments are open below. Most entrepreneurs, myself included, are independent spirits. That is, until 3 years ago. Three years ago, I found myself with heroes, and someone I want to be like. 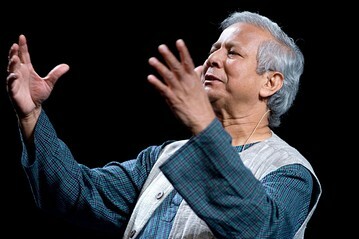 In 2010, I heard Professor Muhammad Yunus speak about humanity. He spoke extemporaneously for 45 minutes, sharing first hand stories of mothers and daughters whose lives had been transformed through education and opportunity; a vision for the end of the man-made condition of poverty; a call to action to all people to end the unacceptable suffering in our worldwide community. That same year, I went to the Dominican Republic and to Chiapas to see the work of poverty-ending microfinance institutions in the field. I saw for myself the bravery of women standing up against cultural oppression; taking steps that no woman in the history of her family had ever taken before so that her children could go to school; finding the right balance between personal initiative and working as a community; taking risks and succeeding with so little capital and time that they put entrepreneurs like me to shame. I found my heroes. When I first started Soap Hope, my intention was to create a strong example of social entrepreneurship so that we could make a huge impact in ending poverty, both with our own company and through others adopting the model and learnings that came out of Soap Hope. And while Soap Hope did grow again for the third year in a row, and we did fund over 10,000 days of microlending for women entrepreneurs this year, most days my vision for Soap Hope still seems distant and fragile to me. As if on cue, this week a friend sent me a video about social entrepreneurs, and when I clicked play I heard the unmistakable compassionate voice of Professor Yunus – there once again to motivate and inspire. Every time I hear his voice, I hear my calling. And when I go inside and ask what I’m to do, Soap Hope always is the answer I see. 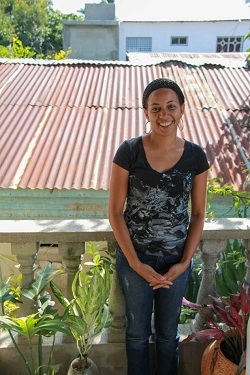 When someone buys one bar of soap from us, it funds one day of microlending for a woman. So I say, “A bar of soap is a day of hope.” This spring, I’m starting a new initiative at Soap Hope called “One Million Days of Hope” – to fund one million days of microlending through sales and partnerships with other companies and organizations. Everywhere Professor Yunus goes, he looks for ways to create partnerships with people, companies, and institutions small and large, to further his vision of ending poverty in our world. Yes, I want to be like him. So I will do the same. One million days of hope would mean 100 times the impact we had last year. It would provide tools and opportunity to thousands of the women who have become my heroes. That’s not something I can do alone. You’ll surely hear me ask you for ideas and action, partnership and participation. Watch for #onemilliondays. Think about how we can partner together. Expect a call from an independent spirit. I often ask people, “What’s the biggest problem in the world?” If you don’t know your personal answer to this question, please stop and take a moment to think about it. When you know what the biggest problem in the world is to you, keep reading. Did you say “potato chips and soft drinks?” No one ever does. Some of the most common answers I hear are water, energy, poverty, intolerance, and war. But did you know that last year, PepsiCo spend over $50 billion in their business of distributing drinks and snacks across the globe? Compare that to the World Health Organization’s (WHO) budget last year of just $5 billion. You may not think of your potato chip purchase as a driver of human behavior, but it is. PepsiCo has built factories all around the planet; hired some of the smartest engineers, scientists, financial minds, and management experts; created an IT infrastructure that spans the globe – all to support the purchase of potato chips by you and billions of other people. It’s because you spend money on snacks and drinks that drives PepsiCo to create this amazing infrastructure and to organize these incredible resources. Are snacks and soft drinks ten times more important than global health? They why do we spend ten times as much through PepsiCo than we do through the WHO? Whatever your biggest problem in the world is, here’s how NOT to solve it: try to convince people to spend their potato chip money on your world problem instead. Trying to change powerful forces like capitalism or culture is a recipe for wasting time and energy. If you want to solve a problem quickly and effectively, use existing forces to accomplish your goal. There are many ways to leverage existing forces to solve world problems. My favorite is to teach companies that they can make bigger profits if they will partner with world-problem-solvers under a model I call Good Returns (see Scaling Social Ventures). So I ask you again, “What’s the biggest problem in the world?” Each person has their own answer, so to make it easy to write about here let’s just call it Your Opportunity for now. Now I challenge you to think about Your Opportunity using our new approach: can you get people to spend money on Your Opportunity every time they spend money on coffee? Can you get a glass cleaner company to spend money on Your Opportunity? Can you create powerful financial incentives for investors in a fast food chain that will motivate them to invest in Your Opportunity? The answer to all these questions is, “Yes.” Now, go do it. Don’t delay, Your Opportunity is here. If you read my blog, please shop at Soap Hope where we carry everything good for body and home. Every dollar of profit is invested into programs that enable women to lift themselves from poverty. If you appreciate my ideas, please write on your blog or Facebook right now about Soap Hope and help me solve the biggest problem in the world – poverty in women. You’ll be busy tomorrow, so write a post now! Dr. Yunus’ model involved lending small sums of money to women in self-motivating, self-regulating groups of women for the purpose of creating sustainable income. His approach has improved the lives of millions of people around the world. The model became known as “microfinance.” One key success factor in his model is that the lender’s primary goal is not to earn a profit; instead the first goal is to lift women from poverty. Dr. Yunus’ approach became so large and successful that it attracted the attention of corporate, banking and political interests around the world – most of which do not have the cause of ending poverty as their priority, but rather see profit potential in lending to the world’s poorest. These interests now dominate the microlending landscape. They have usurped the term “microfinance.” The most egregious of them are big, sophisticated, well-financed and powerfully marketed versions of the moneylenders that Dr. Yunus fought so hard against. I have called on Grameen Foundation and other anti-poverty leaders to create a new, legally protected term for the kind of microfinance that is designed to end poverty, and to develop an international certifying body that will let philanthropists, foundations and social entrepreneurs have a clear picture of what groups are practicing anti-poverty driven microfinance. Minimum standards and practices would be developed by this international body and would evolve as our knowledge, tools and methods evolve. – The lender is either not for profit, of if it is a for profit institution (which is required by law to engage in lending in some countries) then the lender is owned almost exclusively either by a not-for-profit or by the clients of the lender themselves. Another way to think about it: the lender’s profits are not for the enrichment of anyone except the poor. – Although failure to pay loans may impact a borrower’s ability to borrow again, the lender never punishes a borrower for failure to pay. Another way to think about this: a borrower’s financial situation is not to be made worse by having taken a loan, whether repaid or not. – Money is only loaned for purposes of investment (for example business, education, home, and so on) and the borrower must demonstrate a plan for repayment. Loans are never given for paying back other debt or for purposes that do not increase the borrower’s ability to improve her financial situation. – The lender, whether itself or through partners, actively works with its clients to eliminate the drivers of poverty in borrowers’ lives. These drivers are different in various parts of the world, so each lender creates its own approach. Some common drivers of poverty that are currently addressed by Microfinance Plus institutions are: lack of affordable clean water, lack of basic health education, malnutrition, illiteracy, chronic illness, lack of affordable childcare, and cultural or political oppression. There are many more. Each organization addresses its local needs. It is imperative that the anti-poverty driven microfinance industry move quickly to create a protected term and a certification process, because without it we cannot drive large capital flows into Microfinance Plus institutions. Companies like my business Soap Hope (which invests all its profits into Microfinance Plus institutions) and philanthropic donors and investors need a simple and reliable way to identify these groups and to hold them accountable. By making the investment to define and certify what qualifies as anti-poverty microfinance, our industry will be able to grow the number of people served under Dr. Yunus’ original intent. Regardless of any political party, sociological theory, or business organization telling you to the contrary: it is a fundamental part of our humanity to help those who are in great need. It is totally unacceptable to allow another human being to suffer in poverty without assistance. I did not teach myself to read, did not haul my own drinking water across miles today, did not give myself a vaccine against polio. Because I’m smarter or work harder? Of course not – it was a gift of the circumstance of my birth, and yours. A close up look at the lives of those in extreme poverty will show that the poor are creative, resourceful, and hard-working – contrary to common prejudices held by many in the developed world. Realize the amazing enormity of the gifts you were given in life, and give just a small share to those who haven’t been so lucky. Use your time, talent or money – all three if you can. Start right now, not tomorrow. If you don’t know where to start, I invite you to go to any of the pages at the end of this post to learn about nonprofit microfinance, my preferred way of enabling those in very deep poverty to lift themselves up. If you are in a deep well, no amount of creativity and hard work will get you out of that well. You will need someone outside the well to throw you a lifeline, or you will die in the well. Those in the deep well of poverty cannot climb out without a ladder provided by someone else. Nonprofit microfinance is such a ladder. It’s not charity. The recipient does all the climbing themselves. Pick whatever you see as the greatest need that another human being is facing, and begin to do something about it, today – don’t let this day go by without taking an action for another human being who needs you.